This Saturday, November 7, 2015, a memorial ceremony and historical marker dedication will be held to honor those lost in a plane crash that took place on December 1, 1974. Northwest Airlines Flight 6231 crashed just minutes after taking off from Kennedy Airport on its way to Buffalo. A plaque will be placed as a reminder of this tragic event. A church service will be held at 9 am at St. John in-the-Wilderness Episcopal Church, 16 Johnsontown Road, Stony Point. Following the service, at 10:15 am, we will hike approximately one mile from the church to the marker site over gently rolling terrain. (Hikers should be fit and wear sturdy footwear.) Those who choose not not to walk to the site can follow other vehicles to a camp road off Lake Welch Parkway to within a few hundred yards of the site. 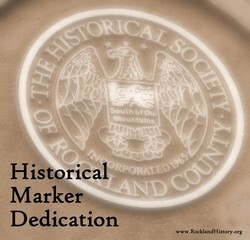 The marker will dedication will be held at 11 am. To learn more about the plane crash and the memorial, see the Journal News article at http://www.lohud.com/story/news/local/rockland/stony-point/2015/11/02/4-decades-later-memorial-stony-point-plane-crash/74864974.